Workplaces are filled with diverse groups of people with equally diverse communication styles. It’s no wonder there are so many personal interaction issues in the average organization, but how a company deals with them is what matters. Given people’s different styles, tendencies and habits, communication issues with peers and management should be expected. Unfortunately, some individuals or groups never find a successful way to communicate, share information and promote collaboration. These people need help to work through their issues. When you find yourself frowning because communication has gone sideways or walking away from conversations with a feeling of uncertainty and confusion, you can be sure there was a better way for that interaction to flow. It could also be that you’ve re-run interactions through your mind to figure out what went wrong or your slack-jawed facial expression means you have no idea what someone is saying. These situations leave people to question, “is the problem me or you?” When communication challenges are frequent and go unresolved they can quickly escalate and leave team members feeling overwhelmed and crazy without any idea how to fix it. If bad communication continues and becomes excessive, it usually doesn’t fix itself. How long can a company let it continue? What if a facial expression eventually gives way to an inappropriate verbal reaction? The problem can be even worse when it involves those of different levels in an organization, like a supervisor and their employee. Or when employees have communication issues but their manager doesn’t take steps to resolve them. This is often the case because managers and supervisors are routinely promoted because of job knowledge and performance rather than people skills. They are rarely trained with the necessary leadership and communication skills. The verbal, and obvious, communication problems occur less than 10% of the time while the less obvious problems of silence and talking behind a person’s back occur more than 90% of the time. All this silence and back door gossip must be deafening. How can a company possibly be successful when no one is talking about what matters? The results tell us about reactions to communication frustrations in these companies and can identify tipping-points that send interactions sideways or point out a regular instigator. When communication is non-verbal and negative, it’s no wonder when job satisfaction and engagement survey results baffle senior management and human resource professionals. More than half the group described that communication problems occur regularly. Given the results and numbers, these companies should soon expect employees to hand in a resignation letter, lie in their exit interview and head to hopefully greener pastures. Now is the time to end the communication craziness. And it shouldn’t matter if you are the observer, the recipient or the offender. Managers must step up and take the lead to provide the fix, offer great role modeling and, if they are, it’s time to stop being a contributor to conflict. Additionally, companies need to either fix bad managers or fire them. 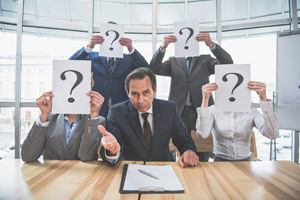 When communication issues are permitted to exist and persist because of poor leadership and interpersonal skills, go ahead and open the flood gates for increased sick days and resignations from employees who won’t tolerate bad communication anymore. Every team or department should be asking the polling questions to their staff that I asked in my session. Find out if there are communication problems, how often they occur, who the offenders are and what non-verbal cues are contributing to problems. If you don’t identify, understand and work to resolve communication craziness, then don’t expect anything other than people problems and HR nightmares. If you are ready for an honest evaluation of your bosses and are open to assessing your workplace communication, the Building Better Bosses program will be a good fit. Contact us at 604-349-8660 or pam@thepossibilities.ca to get started on changing the communication craziness in your company. This entry was posted by Pam Paquet and is filed under Business Assertiveness, Communication, Leadership. You can follow any responses to this entry through the RSS 2.0 feed. Both comments and pings are currently closed.